Reading Room Hours - M/T/Th/F 10 a.m.
until 2:00 p.m., Wed. 10 a.m. until 5:00 p.m., Sat. 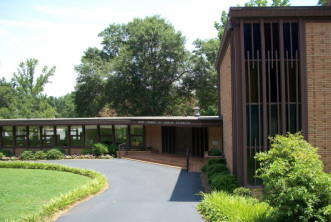 11:00 a.m. until 1:00 p.m.
Our church in Greenville, South Carolina is a branch of The Mother Church in Boston, Massachusetts. Church services are held each Sunday morning at 10:30. Mary Baker Eddy founded the Church of Christ, Scientist in 1879 “to commemorate the word and works of our Master, which should reinstate primitive Christianity and its lost element of healing.” (Church Manual, page 17). Mrs. Eddy grew up in the Congregational church in New England and loved and revered the life and teachings of Christ Jesus. She founded a church so that his healing works would be more universally understood and practiced. Many people attending a Christian Science church service for the first time will recognize many familiar elements—hymns, prayer, readings from the Bible, a warm sense of fellowship. One unique feature is that we don’t have personal preachers or pastors conducting the services. Instead, two lay readers conduct services that are based on Bible Lessons published in The Christian Science Quarterly. These lessons are made up of passages from the Bible and Science and Health with Key to the Scriptures (written by Mary Baker Eddy) and address topics such as God, Christ Jesus, and so forth. There is a simplicity to the services that is very much in keeping with the earliest Christian gatherings where love and healing were at the heart of worship. Please join us for our mid-week testimony meeting held every Wednesday evening at 7:30. The congregation meets for an hour to pray, sing, share readings based again on the Bible, and to give thanks for the blessings and healing experiences that have resulted from our prayers and study of Christian Science. Child care is lovingly provided in our Children's Room during all of our services.